The greatest trophy in sailing may be the America’s Cup but that doesn’t mean there isn’t a lot of other silverware an owner might want on permanent display on their superyacht. The Bennett Indian Yacht Club trophy, created by Tiffany & Co in 1894 and roundly considered one of the greatest American silver masterpieces, will be offered for sale for the first time in more than two decades at this year’s TEFAF Maastricht art fair. Commissioned by James Gordon Bennett Jr and now offered for sale by Koopman Rare Art, the trophy was given as prize to the winner of a two-yacht race between Andrew Barclay Walker’s Ailsa and the Prince of Wales’ Britannia held off the coast of Nice in March 1895. Comprising a triangular course of 30 miles with eight turns, the race drew a huge crowd who saw Ailsa narrowly beat Britannia by just two minutes and one second. 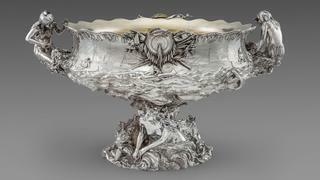 Standing at 25 inches and taking the shape of an ornate punchbowl, the Bennett Indian Yacht Club trophy was revered as the most beautiful and expensive (it cost $2,500 – a staggering sum at the time) yachting trophy in the world at its unveiling. Featuring an opulent base cast with mermaids and dolphins, the sides of the bowl are carved with scenes of Native American canoeists and steam ships while the handles take the form of two kneeling squaws. The Bennett Indian Yacht Club trophy has an asking price of £450,000 and will be available to at TEFAF Maastricht 2016 from March 11-20, 2016.